This incredible bouquet of pink Chrysanthemums brings the surprising arrival of Spring and Summer all rolled into one and a feeling of joy and wellbeing. 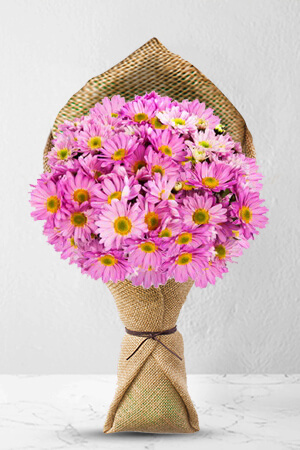 Send Pink Surprise and let all those feelings move a loved one.Vase not included , however if you would like to make your flower gift extra special, we recommend the Premium Vase for Pink Surprise. A staff member was very helpful to confirm a previous flower order was delivered. Easy to order, got call from friend saying it had arrived and was thrilled with the unique design. You always do a great job and she always loves the flowers she gets. I'm always happy with the service, communications and promptness of delivery. I am based in New Zealand and have used your service many times now to send flowers to my mother in Australia. I always feel confident in the product advertised and know she will love whatever she receives. Thank you! I had to call as I had made a mistake and along with the ease of the online order made for a great experience all round. Thanks for the reminder and easiness for the Mother's Day flowers delivery from your company online.